When we arrived at Tongabezi we knew that for a few days our troubles associated with overland travel would all be forgotten. It was needed after a very rough time at the Kazungula Ferry crossing. Overlanding with your own vehicle in Africa is not always easy, to say the least. 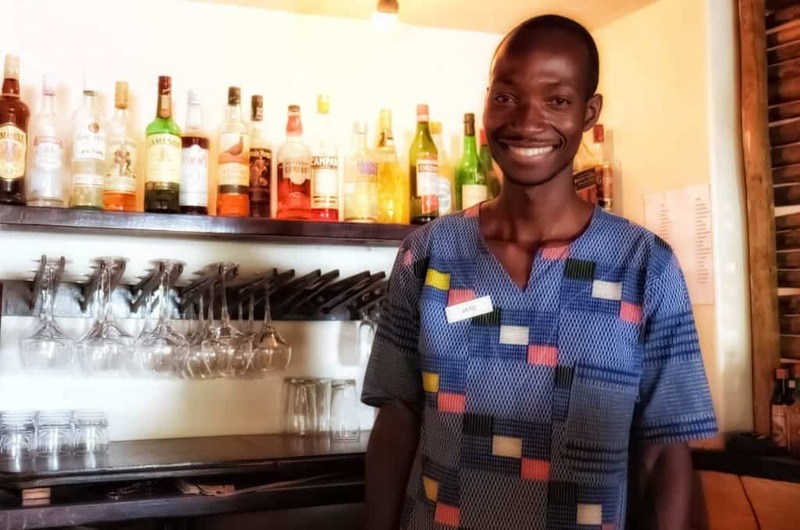 The friendly Zambian staff greeted us with a refreshing aperitif and told us not to worry about anything and led us to our home for the next few days. 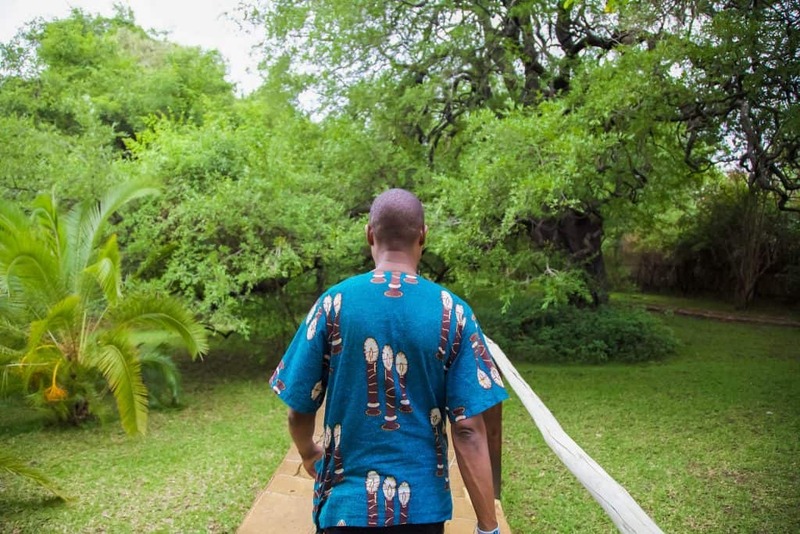 Each room at Tongabezi has its own appointed valet. This personal valet watches over you and your room and makes sure you have everything you need from fresh towels to hot coffee. We made our way to our room eager to relax and chill out after the long day. When we walked into our “room” that was twice the size of our old New York apartment complete bliss set in. 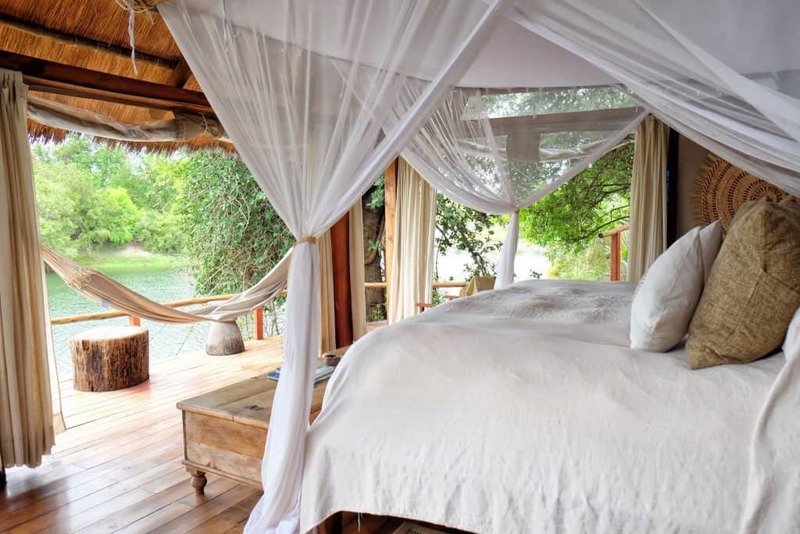 The room felt like we stepped into heaven with couches and a massive comfortable bed overlooking the private deck on the Zambezi River. The bathroom was the best part to come, beautiful tile work and a cast iron tub already filled a bubble bath. Forty-five minutes after our worst border crossing in Africa yet! I loved chatting with all the staff members at Tongabezi. From the guides to the bartenders, to the room attendants and to the chefs, every individual had their own unique story to tell. It’s evident that Tongabezi has put a lot of care into training everyone here as service truly shines through. It’s not just the basic things like taking orders or making a bed, it was the other actions that made Tongabezi truly special. Actions like getting surprised by a bubble bath, or remembering names and favorite drinks. All these traits became daily luxuries at Tongabezi. 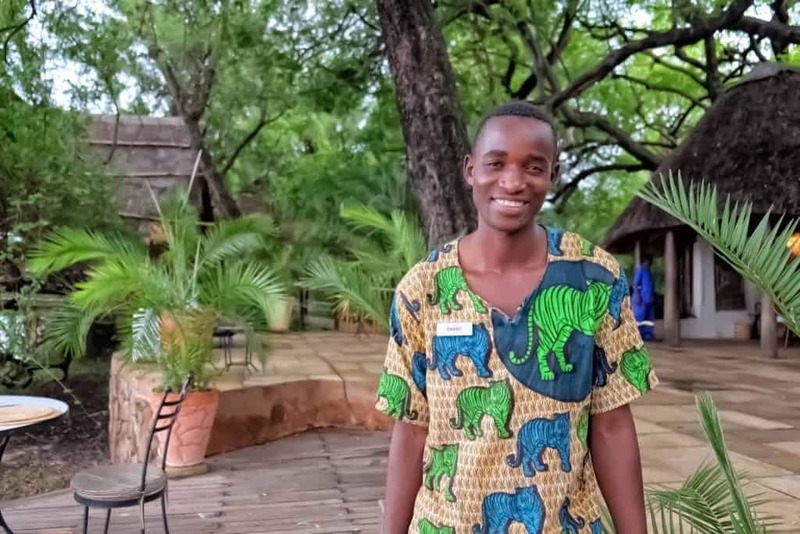 Many of the staff members also come from all over Zambia, meaning they are some of the friendliest people in Africa. The food at Tongabezi is without a doubt the best we have had in Africa. Chef Zuwi Nawa is the head chef here and takes great pride in their cooking and it shines through the taste and presentation of the food. There are also four chefs, two pastry chefs, and two full kitchen teams so there was no way possible for us to ever have a bad meal.For each breakfast, lunch, and dinner you are presented with a menu with countless options for each meal – and yes it was hard to choose each and every time. 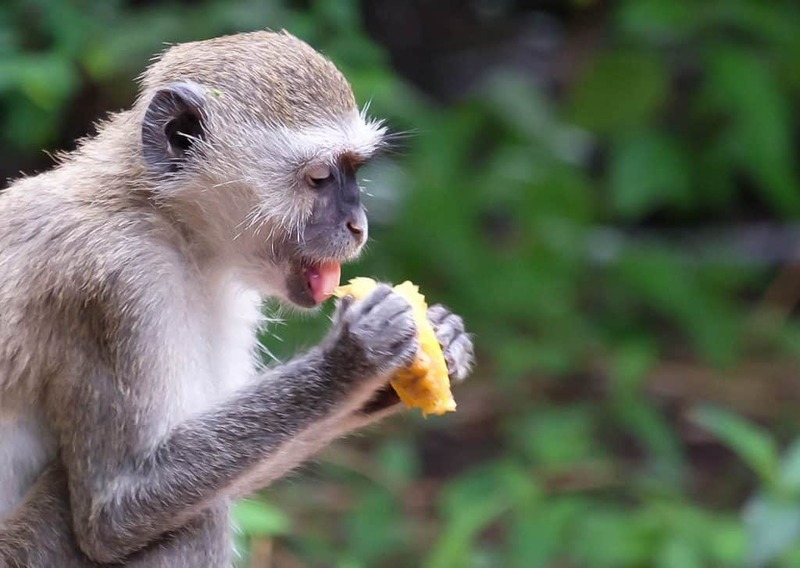 The meals are not just your typical Zambian fare either (although they can be). 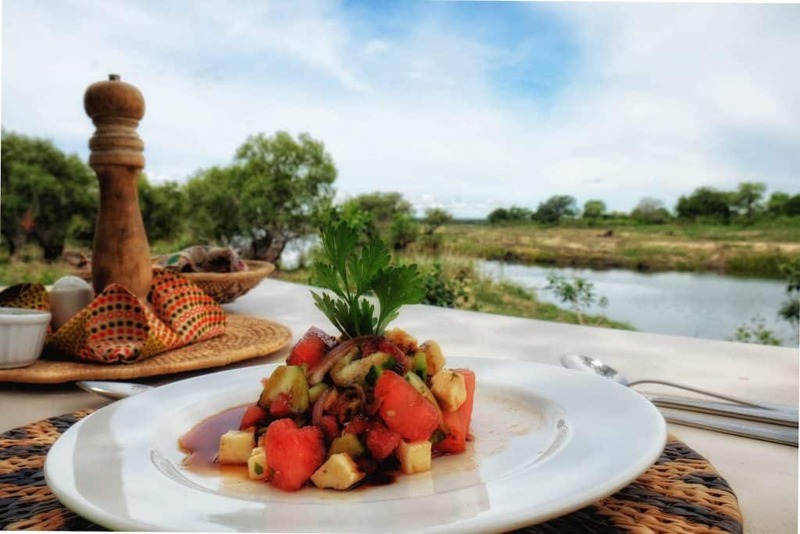 Throughout the course of our stay, we had Moroccan, Italian, French, and even Thai inspired foods made with ingredients from Tongabezi’s own organic garden. It left me wondering who was behind the line cooking all these amazing dishes only to find out it was some very talented Zambians who had clearly mastered the art of bringing international dishes to Zambia. Watermelon hearts and feta, good start to lunch! Not one dinner was the same at Tongabezi. 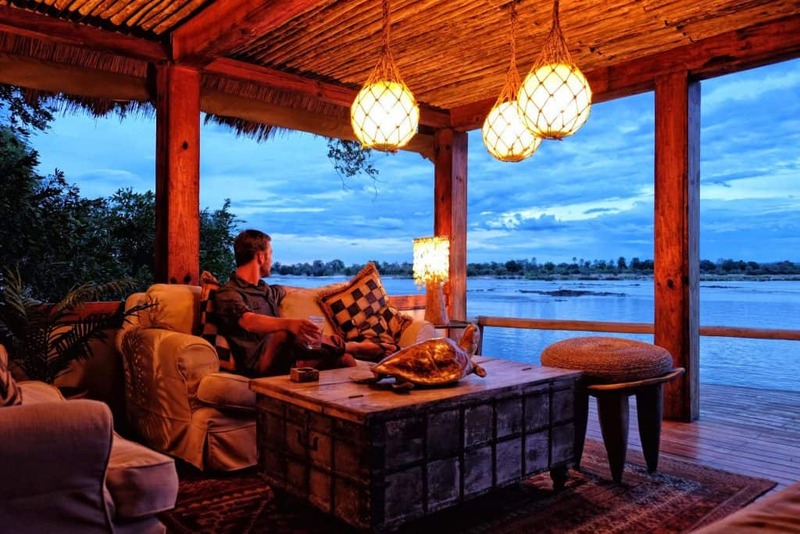 Our first night at Tongabezi we had our most romantic dinner in four years of dating – the sampan dinner. Let me tell you about the Sampan dinner. The experience is unique to Tongabezi and it is truly magical. 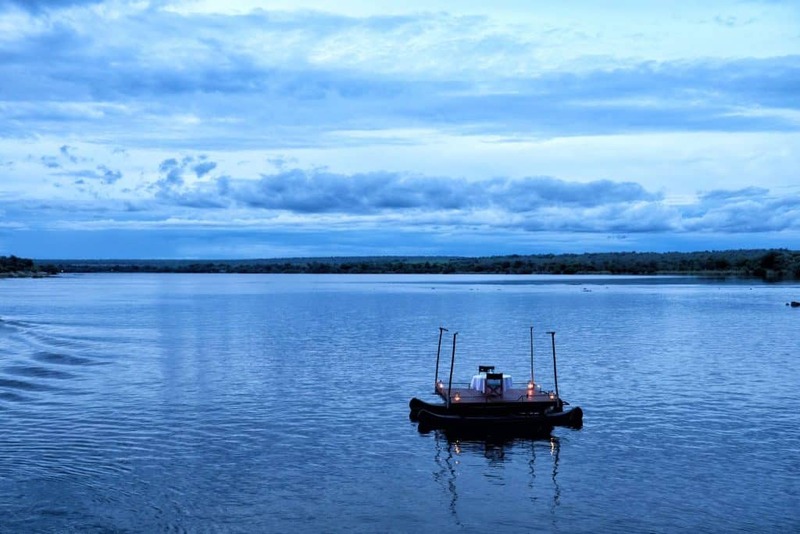 In its essence, it is an evening filled with divine food, wine, the Zambezi River, and sweet Zambian melodies. A white linen tablecloth draped over an intimate table setting, topped with candles, surrounded by lanterns, a bottle of your favorite wine waiting for you on the river. You arrive by boat and after being served your drinks dinner begins. All three of your courses are delivered by boat. 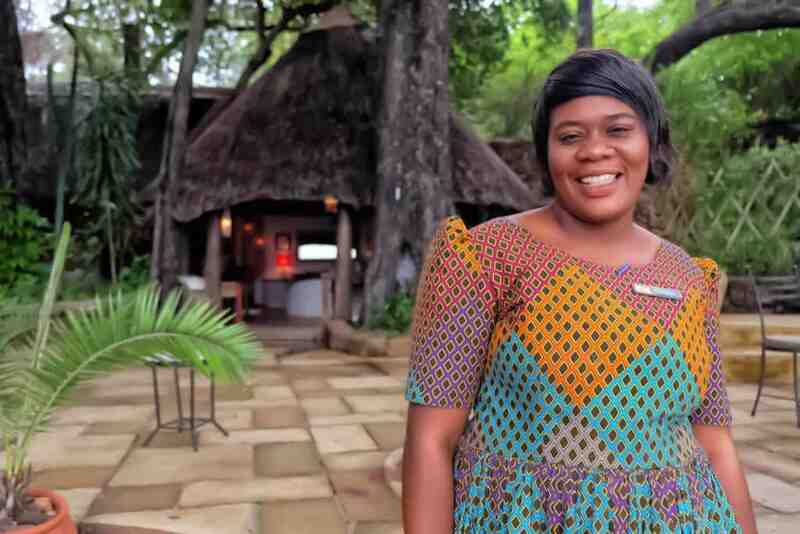 The waitstaff paddles each dish to you and presents it with the exceptional service we came to expect at Tongabezi. After the delicious meal, the evening is finished with dessert and accompanied by the full wait staff serenading you on the river. It was arguably one of the best experiences of our lives and a wonderful evening. The sampan dinner is without a doubt a great choice for dinner, but even the next night atop “The Lookout” was great too! The Lookout is similar to a treehouse and is the perfect location to chill out next to the river. This is where we shared breakfast, lunch, and dinner on more than a few occasions. It may not be a floating dinner on the river, but it is overlooking the river and that is the second best thing. Added bonus, no risk of falling in the river too. Perhaps one of the main reasons we were so excited to stay at Tongabezi was because of its various accolades. 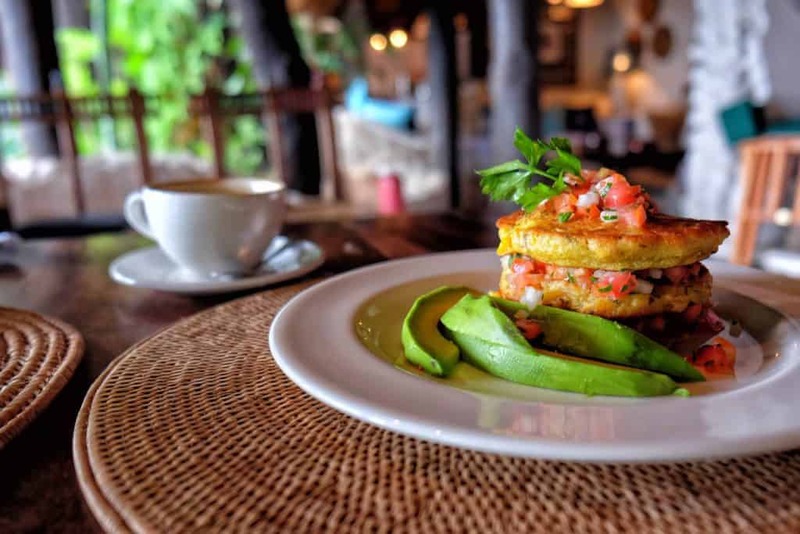 The lodge has been named one of the top 100 hotels in the world by Travel and Leisure and also considered one of the top five in all of Africa. 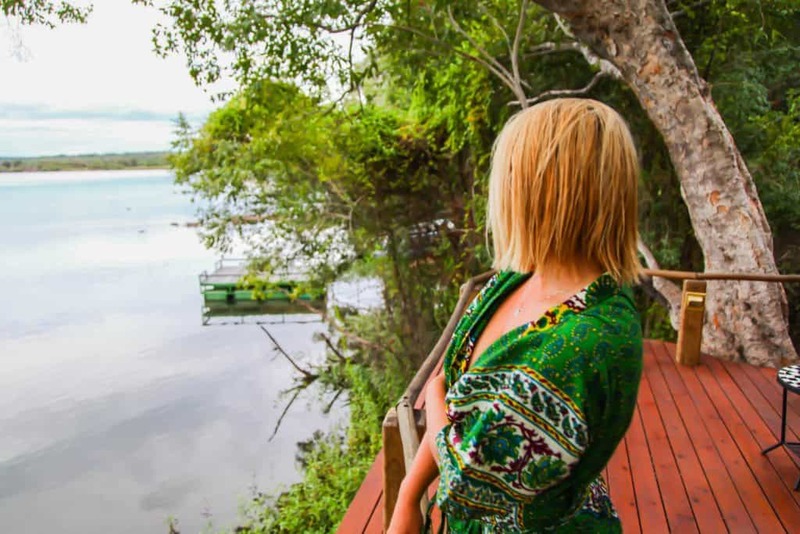 Tongabezi is definitely the number one eco lodge in Zambia and we wanted to check out how it runs ourselves. They have a still and sparkling bottling system and filtration that saves 20,000 plastic water bottles a year, which makes my anti-plastic mind incredibly happy. 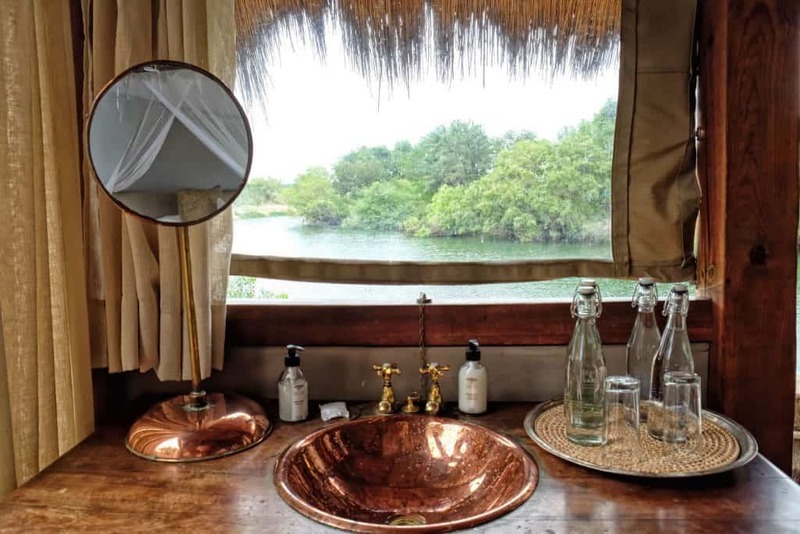 Wood supplies come from the Copper belt in Zambia and are taken from sustainable forests so even having a sundowner around a fire at Tongabezi is good for the planet.All the toiletry and cleaning products are 100% biodegradable and even the staff uniforms are repeatedly recycled. They also have Sindabezi Island an eco-friendly haven, but more on that later. Besides eating and basking in African luxury, there are an endless amount of activities to do at Tongabezi. After we relaxed with a few sundowners our first night we discussed with the Tongabezi team what we were going to be doing the next few days. 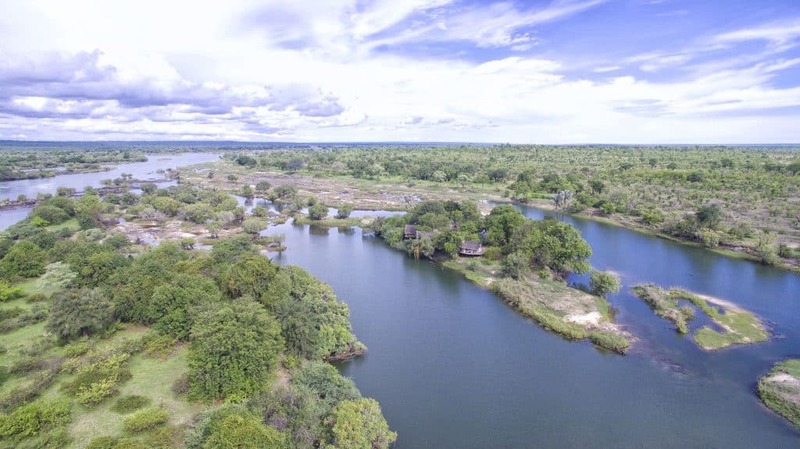 The amount on offer is endless such as trips to the infamous Devils Pool, a microlight over Victoria Falls, canoeing and fishing on the Zambezi. We had a tough time deciding what to do, but eventually decided that we would like to go canoeing, enjoy a few coffees on the river for sunrise, and go fishing. We hadn’t been canoeing in Africa yet so this was a particular highlight for Cameron and I. Albeit we were a bit nervous of the hippos, but we had an excellent guide to make sure we were safe. 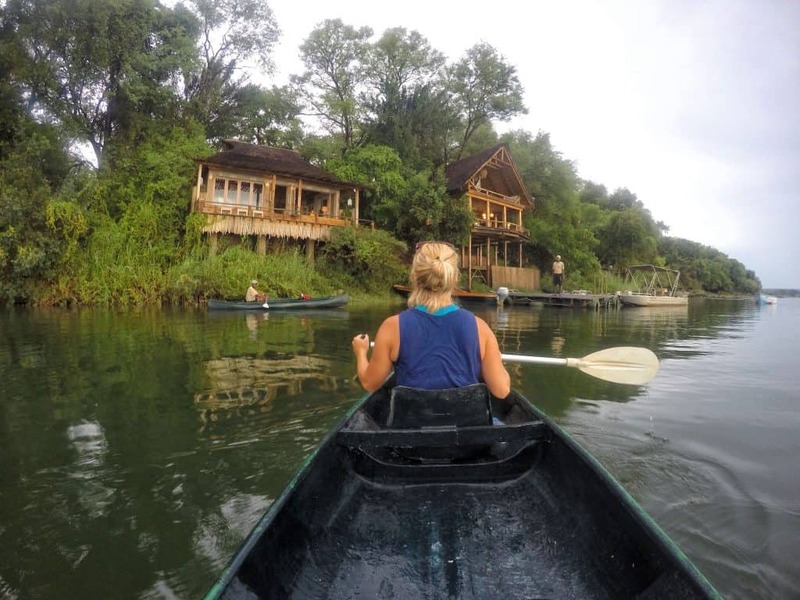 Canoeing on the Zambezi is unlike any other experience as we were able to get up close to birdlife without scaring them away with a high powered motor. Capt. Ronald took us out on a sunrise boat cruise which is offered every morning. After traveling Africa for a few months we know that the best time to see wildlife is early morning or late afternoon when the sun is less intense. On the boat cruise, we saw plenty of hippos, crocs, and a plethora of birds (we’ve recently become birders). Cameron decided to take the afternoon and go fishing, while I decided I had enough fishing for tiger fish and ventured into something different. Right next to Tongabezi is Tujatane School. Tujatane means “Let us all hold hands together” in Tonga. 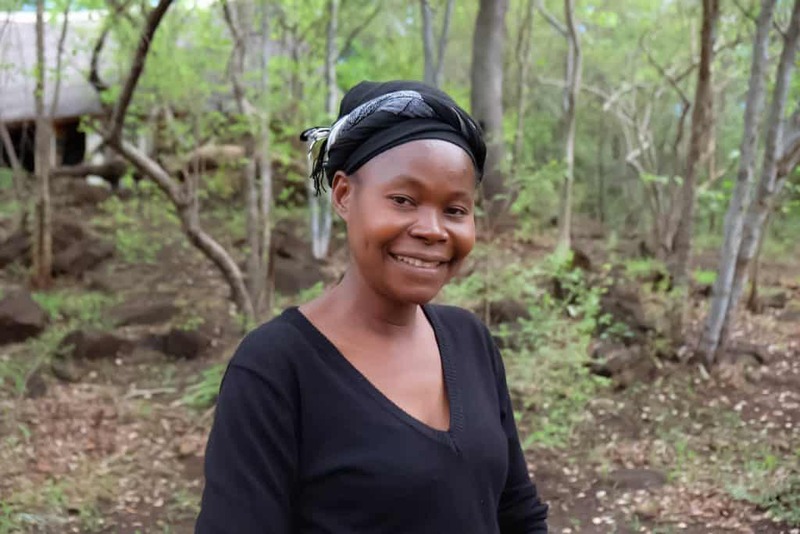 Tujatane was started by Vanessa, one of the owners of Tongabzi, in 1996. I decided to venture over here while Cam was having his fishing time and was instantly blown away by the sheer size of the school. 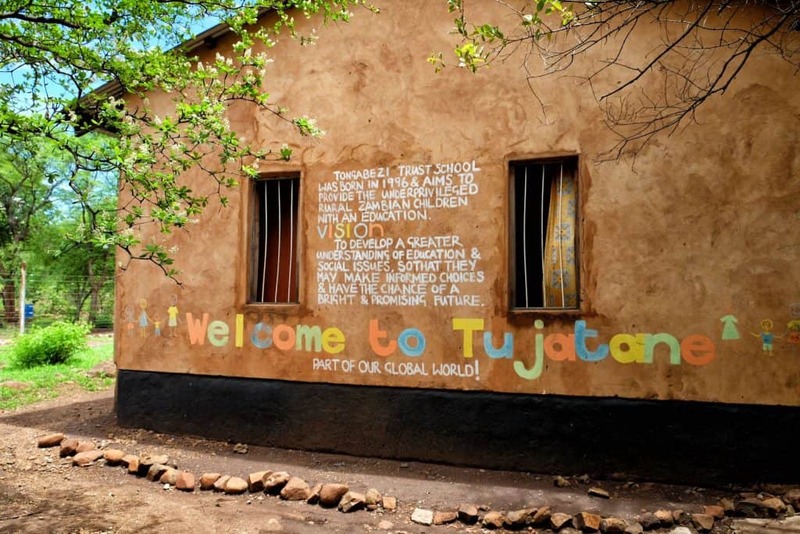 Tujatane started with only 15 children, and they now have over 200 kids attending school. 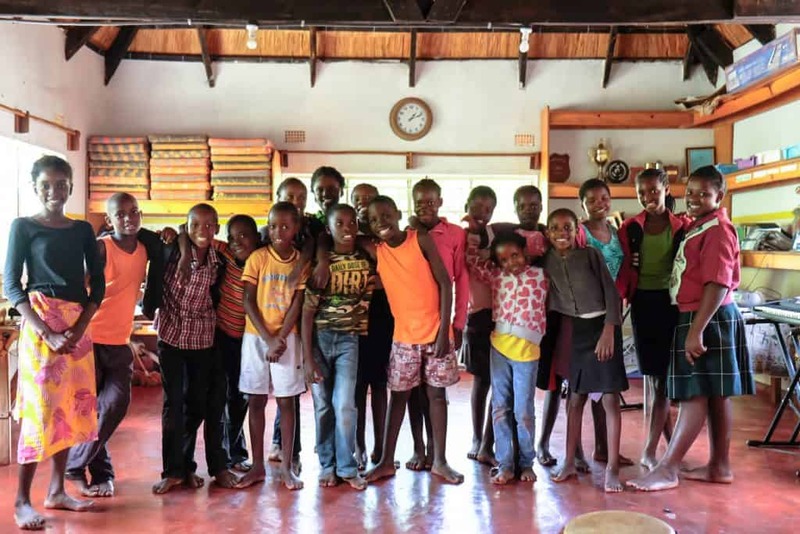 Most of the kids come from nearby villages or are children of the Tongabezi staff members. The school has nine classrooms, two offices, a library, a kitchen, an amphitheater, a computer room, a reading room, and a music room. Many of the kids were in music class when I visited so I went to hear them sing and dance, which was absolutely incredible. The kids are extremely talented and even take their musical skills to a competition level! I couldn’t believe that such a school came to be from Tongabezi and the hard work of Vanessa. It was really great to see the children learning and knowing that they were given the chance for a brighter future. The school is completely funded by donations and generous sponsors. Her son went to Tujatane and is now getting his Masters Degree! It eventually came time to leave Tongabezi. Thankfully we were just headed to Sindabezi Island. 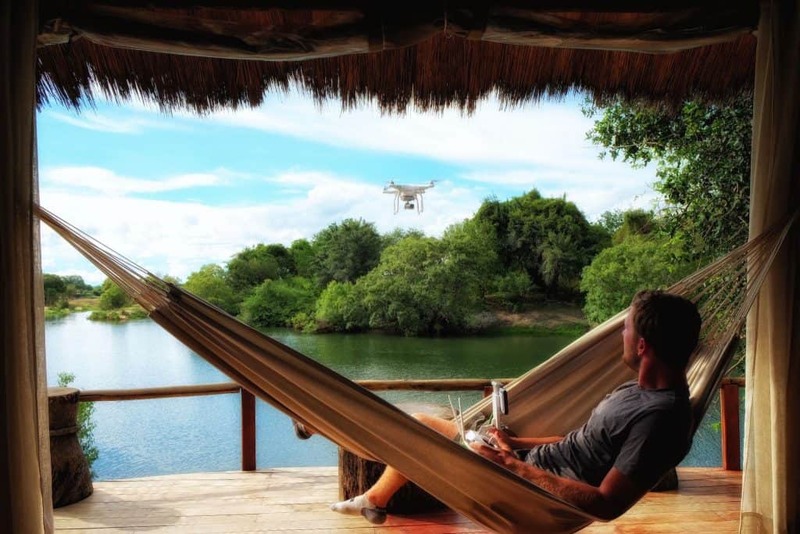 Sindabezi Island is a self-sufficient eco-lodge in the middle of the Zambezi. Sindabezi operates through Tongabezi, but is a separate lodge with five rooms and separate staff. 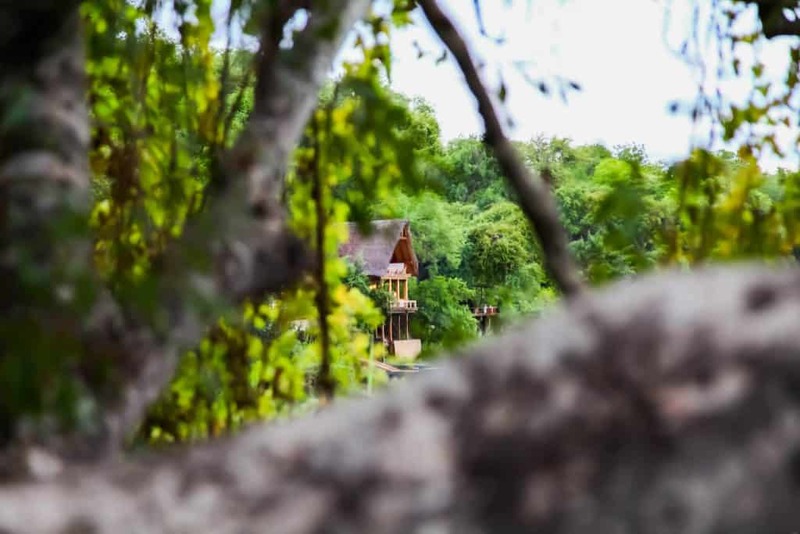 Sindabezi has been named one of the top ten eco-lodges in Africa by Fodor’s, and since we have been aiming to be more eco-friendly we were ecstatic to travel here. Sindabezi is a bit more seclusive than Tongabezi. 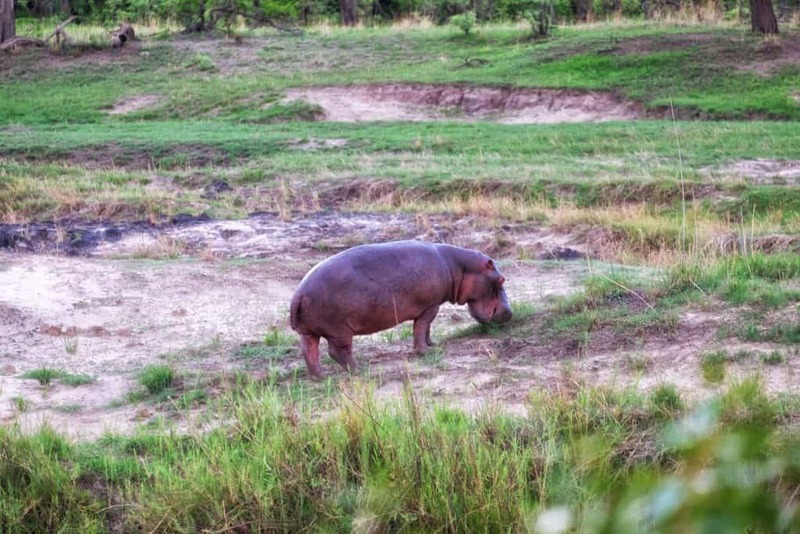 You are literally on an island right in between Zimbabwe and Zambia, with no one around but the hippos. There are still a few staff members and a wonderful chef cooking up all that food I’ve already talked so much about. There are only five open thatched rooms on the island, but since it was low season, we were the only ones occupying Sindabezi Island. So essentially we were the King and Queen of Sindabezi Island for a night. The island is entirely solar powered, there is no plastic, and all the cooking is done with gas. Birdlife is abundant on the island and given the location crocs and hippos sometimes call the place home. The only way to arrive on the island is by boat from Tongabezi, which offered us another great chance to see the wildlife from the water. The same activities that are offered at Tongabezi are still on offer at Sindabezi. Since we had already been playing on the Zambezi before, we decided to take a break and enjoy our little island that we had all to ourselves. When else can you declare yourself the king of an island (unless you’re Tom Hanks in Castaway). We spent the afternoon relishing in nature, bird-watching, and playing board games with the staff. We may have even had a little private time to fly our drone too. We’ll definitely be dreaming about the day we return to Tongabezi for the rest of our lives. 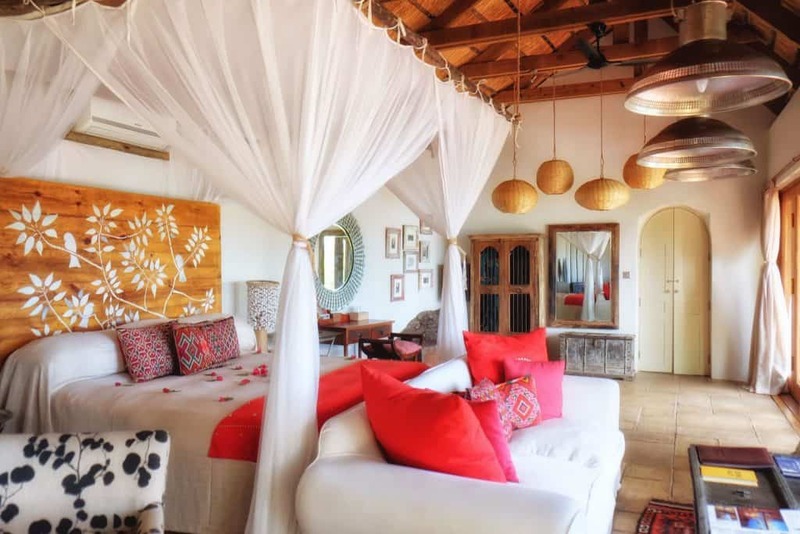 It’s not only a little slice of Zambian paradise but also just pure African bliss. If you coming from the Kazungula Border Post. Tongabezi is about a 30-minute drive away. Tongabezi is about a 45-minute drive to Livingstone. From there it is another 15 minutes to the Vic Falls border. After we left Tongabezi we made our way towards Zimbabwe via Vic Falls. Unlike the Zambia/Botswana border, we had a relatively pain free experience entering Zimbabwe. One day visas into Zimbabwe are available at Vic Falls. The Zambian side of Vic Falls is easily accessible from Tongabezi. It’s worth noting that the Zambian side of the falls is where you can experience the famous Devils Pool; however, the best views of the falls are from the Zimbabwean side. 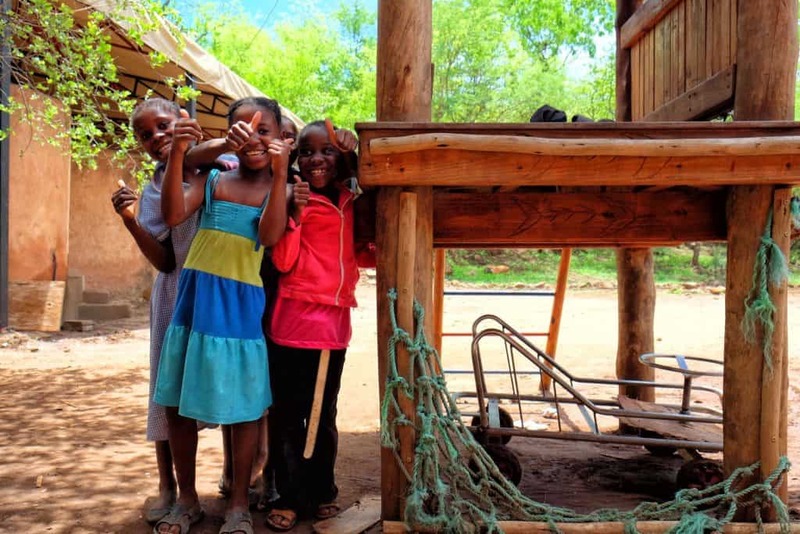 Tongabezi isn’t a budget destination, but considering all that goes into running the eco-lodge the cost comes for good reason. Prices start at $655 per person per night and include all meals, alcohol, and most activities. Check out their website to see their current specials! Check out the rates for Tongabezi here! Flights to Zambia: Travelocity is a comparison website that searches millions of flights. Once you find your best deal, book directly through the airline (no extra fees). Car Rental in Zambia: We decided to go ahead and buy a car in Africa. If you want to drive around Africa without the commitment of renting a car in South Africa with Auto Europe is a great starting point.